A new façade system launched by Holland-based Hunter Douglas can protect Middle East skyscrapers from extreme wind loads, the company says. The new QuadroClad 200 (QC200) panels have tested positively for wind loads up to 3,000 N/sq m – more than the load produced by a Level 12 hurricane, more than three times the load in the International Building Codes, and twice as high as standard façade systems, said a Hunter Douglas statement. This facade system will be helpful to the UAE and Qatar which rank third in the world in skyscraper completion, it stated. The two Gulf states have each completed four skyscrapers more than 200 m high in 2014, a record year with 97 skyscrapers completed, said the Dutch firm citing data from the Council on Tall Buildings and Urban Habitat. Also, the UAE hosts nine of the world’s 100 tallest buildings under construction. 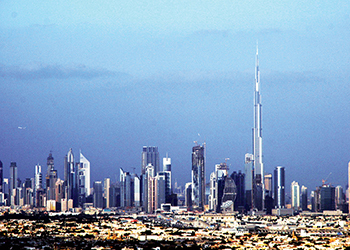 “As the Middle East, and especially the GCC, host taller and more complex skyscrapers, architects need to design buildings that take into account the high winds speeds that put extreme stress on building facades,” explained Santosh Raj, sales manager (architectural projects) for Middle East, Hunter Douglas. The QC 200 panels, he stated, can be mounted on different substructures, offering architects more design freedom and installers more installation options. “These panels also fit into the current trend towards visually clean facades, with 12.5-mm joints that appear to be closed, yet allow for ventilation and drainage of rain and condensation,” said Raj. According to him, QC200 is easy to install, as the system is hung in place by means of an extended profile, rather than with separate brackets and clamps. The panels can also be installed on substructures from different manufacturers, making it easy to tailor the weight of the construction to the technical specifications of a project, without affecting the quality of the system. QC200 also offers an answer to current trends in architecture towards smooth, clean façades by means of optically closed joints of 12.5 mm, Raj stated.